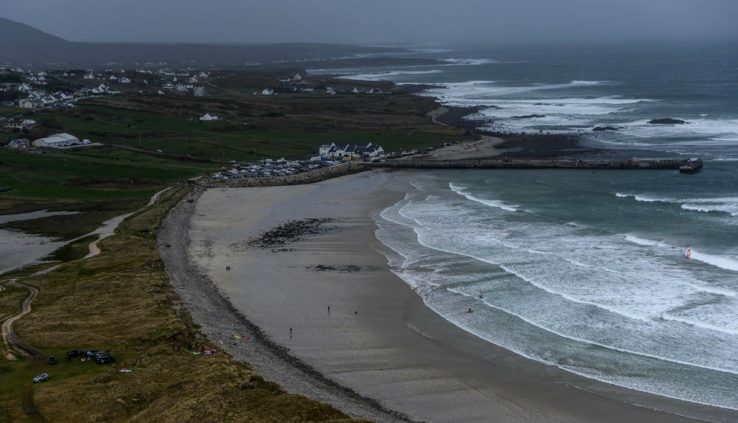 Winds up to 70 knots, waves up to 8 meters, cold water of the Atlantic, snow on the beach… Not the best weather for Windsurfing? Maybe someone thinks so, but not these guys are desperate! They were waiting for these conditions for three years and escaped to Ireland from their homes across Europe heard about the impending storm. To get to Ireland in time, they had only 72 hours. Welcome to the Red Bull Storm Chase! We do not need the Turkish shore, and Africa we do not need! Eight brave men arrived at the North of Ireland in the town Machirori (Magheroarty) on 9 March and immediately set up some test rides. “You guys are crazy! Well the truth is too cold for Windsurfing! Good luck!” — never tired of fans cheer their favorites on social media. The competitions took place over the next two days, 10-11 March. In the photo — the Australian Jaeger stone (Jaeger Stone), ready for action. German Philipp Kester (Philip Koester; left) and Venezuelan Ricardo Campello (Campello, Ricardo; right). Why don’t people fly like birds? German Leon Jamaer (Leon Jamaer) seem poised for another spectacular leap. Ricardo Campello in the jump broke up with her wing, and gravity, grinning mischievously, immediately reminded him about the law of gravity. Frenchman Thomas Traversa (Thomas Traversa) is heated in the machine waiting for their turn. Jagger stone rides the wave. It seems that people these people emotions from super extreme competition important prize. But still nice to get the award. Best was Jagger stone. In second place is Philip Koester, and “bronze” went to Leon Camero. Honorable fourth place was awarded to Brit Robby swift (Robby Swift).